Men are highly unlikely to go through their whole lives without experiencing some level of hair loss. By the age of 60, around 65% of men will have noticeable hair loss, and this number jumps to 80% by the age of 80. But despite male pattern baldness being an extremely common condition, many men are still self conscious about it. Thankfully, there are effective treatments available (more on that below) but spotting the signs early will give you a greater chance of delaying, preventing and even reversing hair loss with the right treatment in place. With that in mind, here are 7 early warning signs of male pattern baldness to look out for. When changes happen over the course of months or years, it can be difficult to see them. Comparing your current hair thickness to old photographs will give you a clearer idea of whether hair loss is becoming an issue. A small amount of hair shedding is perfectly normal, but if your pillow is particularly hairy first thing in the morning it can be a sign that male pattern baldness is underway. The same is also true of finding hairs on your shirt shoulders, or on your desk at work. Male pattern baldness usually starts at the hairline, so this is likely to be where the first signs occur. You may notice your hairline forming an ‘M’ shape which overtime recedes further to a ‘U’ shape. Keep an eye on your reflection to see if you spot any changes. After the hairline, the crown is the most common area for male pattern baldness to develop. Hair loss will spread outwards from the top of your head, which can be trickier to spot so you may need a handheld mirror. If every time you comb your hair you pull away a significant clump of strays, this is a clear sign that hair loss is on the cards. This simple action could be making your hair loss worse by causing unnecessary friction, so be sure to comb gently and avoid tugging on tangles. If styling your hair has become more difficult and it feels different to run your fingers through it, there’s a good chance that it’s thinning. It may appear wispier with more flyaways. Male pattern baldness is a genetic condition, so if you notice other male relatives going bald then you need to keep a close eye on your own head of hair. Finding out when exactly older relatives started to lose their hair can give you an idea of what kind of timescale to expect. 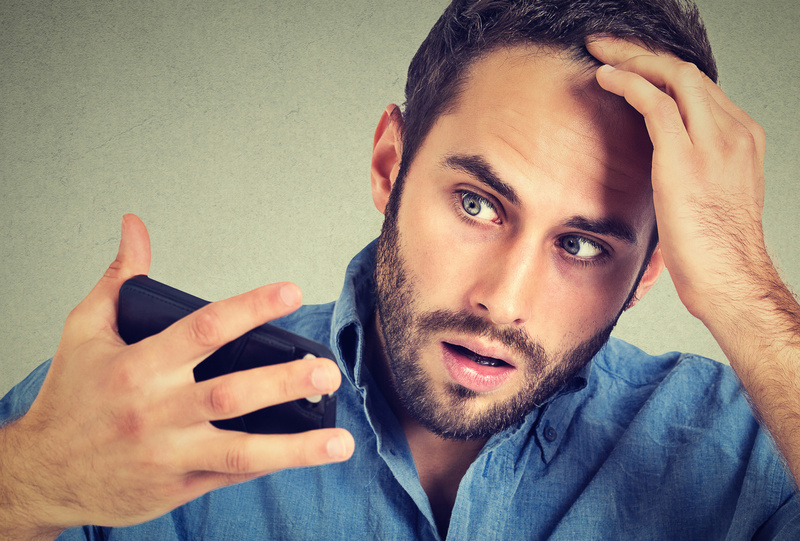 If you notice any of these early signs of male pattern baldness, it’s important that you seek treatment as soon as possible. Propecia and Finasteride (Propecia’s unbranded medical equivalent) are two safe treatment options available from Express Pharmacy, both of which have been proven in their effectiveness at treating male pattern baldness. In both medications, 99% of men had visible results after two years of treatment — 66% experienced hair regrowth and a further 33% had no further hair loss. When using either of these medications, you should start to see results within three to six months. Find further information and support for a variety of health concerns by contacting the Express Pharmacy team. You can call us on 0208 123 07 03 or use our discreet Live Chat service.